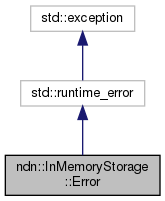 Represents an error might be thrown during reduce the current capacity of the in-memory storage through function setCapacity(size_t nMaxPackets). Definition at line 105 of file in-memory-storage.hpp. Definition at line 108 of file in-memory-storage.hpp.